My fourth big project also was my first participance in a contest. 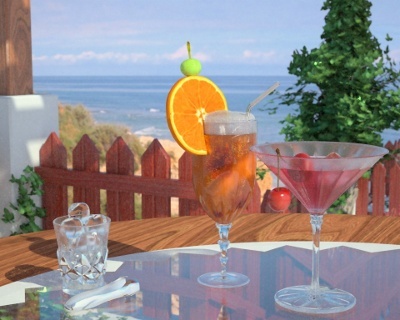 The mission of the contest on blendpolis was to create a cocktail and to present it in a nice ambience. 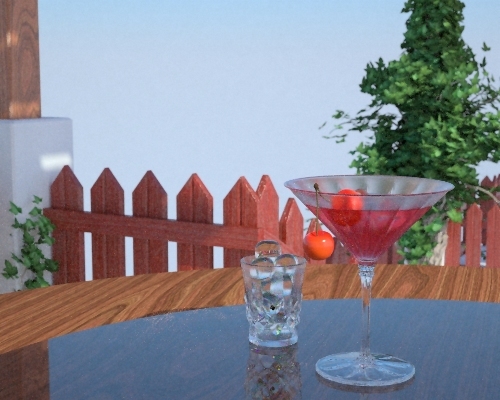 The final image was intended to be a still life with the focus on the cocktail. Now I thought that probably wasn’t bad, but I needed a background, I needed some better light setup (there are only three small rectangles of sun coming through the roof, visible on the upper left side – not good for presenting a cocktail in the foreground) and I thought I needed some more objects for the front – simply because the table was not full enough to pull the eye to the foreground. Today, I’m not sure whether I really needed some more stuff there, and I am definitely sure that it was the wrong reason to create some more stuff to fill the table, but, looking at the result, I guess it wasn’t that bad. As a background, I chose an image from my holiday in Portugal, some photo I took at the Algarve. After placing it there, I found out that the colours looked wrong because the photo was mainly lit by the sun being a bit orange. In blender, I would have set the material to shadeless and things would have been ok again, but in Indigo, I didn’t really know how to fix that and so my next image looked a bit strange in the background. I highlighted the glass on the table (which no one recognized as glass) by removing the wood under it, making it possible to see the things behind the table. People didn’t like that either, so I removed it later, replacing the table again. As I already mentioned, I replaced the table again – I made it totally out of wood, being a bit more discreet than any pieces of glass or mirror and therefore highlighting the cocktails a bit more. 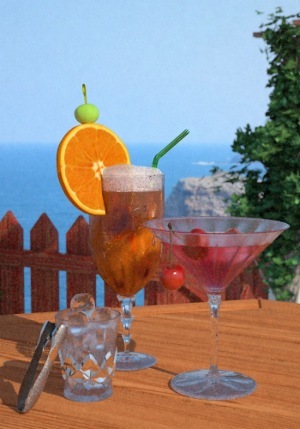 Nevertheless, the cocktails were somehow lost in the image, standing on one side of the image in front of a colourful background. To change that, I switched from a nearly squarish format to an upright format. This way, I could concentrate the foreground on the cocktails and was able to hide some of the background. Then I changed the background image. Originally having the reason that the old one simply wasn’t high enough (didn’t show enough sky) to look correct in an upright format, I also chose the new image a bit more carefully to be not as colourful as the old one. I also did some colour correction in the image to look relatively good despite the sun lightning. The last important change now was the replacement of the fence and the shell filled with pistachios. I know many liked the fence, but it was too colourful and really melted together with the cocktails. Painting it white or removing the red paint from it made it slightly better, but not really much and so I replaced it and put some ugly piece of jetcrete there. White and dirty, but nothing unusual for the southern area of Portugal and definitely more unobtrusive than the fence. The shell was relatively difficult to model (in contrast to most of the other objects in the scene). But it was worth it, since it looks really well in my opinion, and fits nicely into the scene. The pistachios are hand-duplicated (without physics). Their texture comes out of my scanner (maybe because I wanted to have at least one fully self-made texture). Then came a long period of rendering (about 15 hours) and post-production in gimp and violet tone mapper. 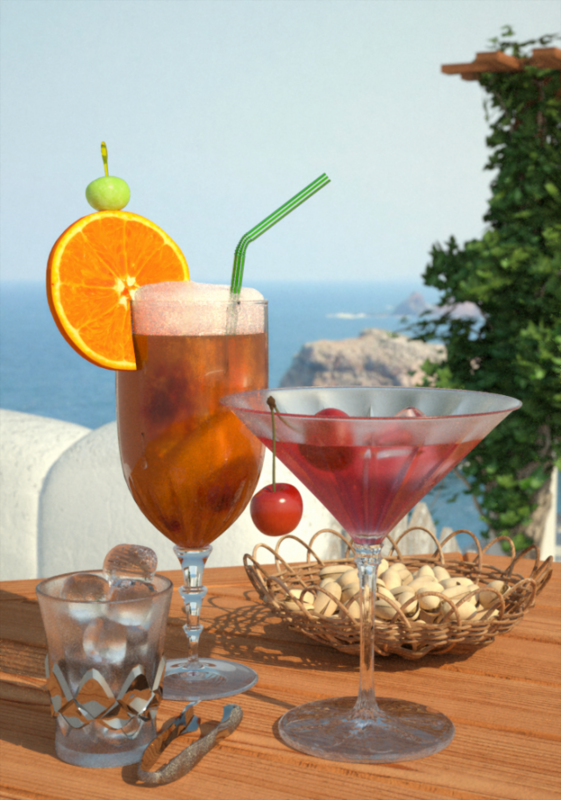 The problem with the rendering time was that I had to submit the image soon (yes, the time had passed much too quickly) and still tried to change the material of the jetcrete and the two pieces of fruit on top of the orange cocktail (no, it’s not beer). So I rendered the image while doing other test renderings, then stopped rendering and took the raw render data (normally used to continue a render process after a pause) to render over it with new settings, slowly blending to the new material while rendering. Some bloom in gimp, some colour correction and I submitted the final image, being relatively happy with everything except the fruit material. But I accepted that, and decided not to change something after the deadline of the contest because I had enough of the image (isn’t it always like that? ).